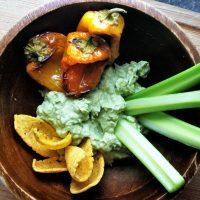 This goat cheese guacamole recipe isn’t only a great addition to your meal, you can use it as a dip or eat it by itself. Add avocado, goat cheese and cilantro to a bowl and mash to a creamy consistency. Add lime juice and salt and blend well. Serve with veggies, chips or your favorite beverage.